Welcome back, y’all! It feels like it’s been so long since we did a Munchkin Meals and I’m back with an extraordinary display of culinary brilliance in Hailey’s (10 months old) meals! Though I’ll admit breakfast may be a bit on the fancy side, the rest of the meals are a great example of our usual. I tried to give some perspective on the quantity Hailey eats, too. 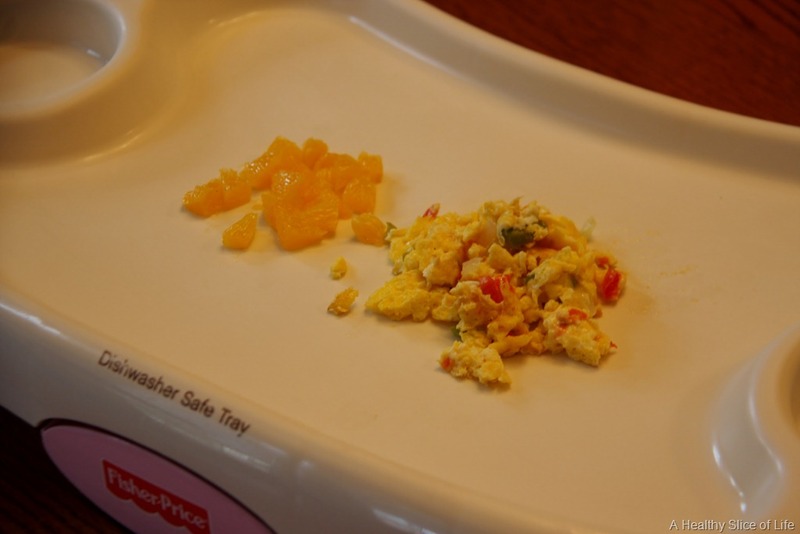 Above is about 1.5 eggs, scrambled with green bell pepper, onion, tomato and cheddar cheese. Oranges cut up in tiny pieces on the side. 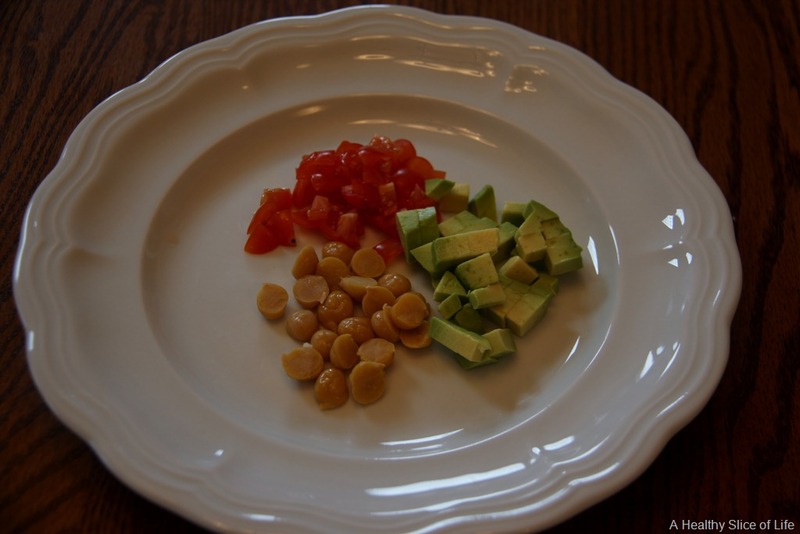 Lunch was sliced chickpeas (drained and rinsed from a can to reduce sodium), diced cherry tomatoes and avocado. She ended up eating half of a small avocado. 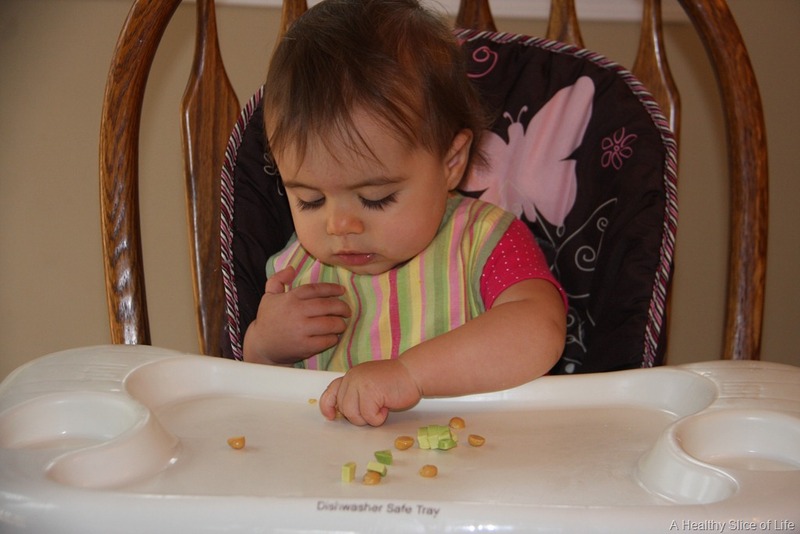 It was her first time with chickpeas, and though unsure at first, eventually they all went down the hatch. Dinner, again, was simple. 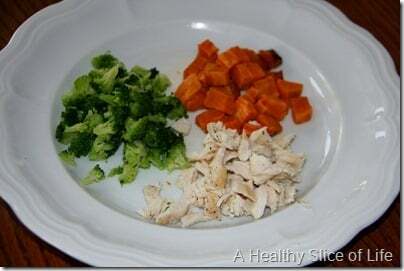 Frozen organic broccoli, sweet potato that I roasted earlier in the day and stuck in the fridge and chicken tenders that I pan-fried stove top with olive oil. 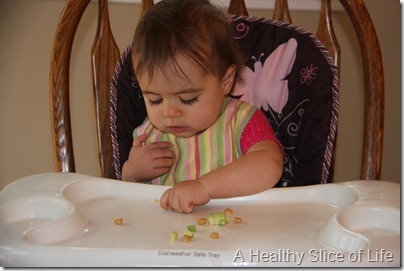 What is your munchkin eating? So, this might be a stupid question, I don’t have kids yet myself, but seeing as how she started eating real foods so early I’m curious: How does she CHEW with no teeth? It seems like she’d just have to swallow the little pieces whole?? Not a stupid question at all- I wondered the same thing! With the veggies and fruits, they are typically soft enough that she can mash them between her gums (it’s amazing how tough her little bite is). THings like chicken, she pretty much swallows the pieces whole so I make sure to make them really small. What a good little eater!!!! I totally meant to post today but, yeah, time got away. As did the food. I’ve been trying to make things in bulk that I can freeze. For breakfast, Miles had a mini zucchini muffin (homegrown zucchini, homemade pear puree subbed for oil, low sugar) and a frittata muffin with egg, ham, onion and cheese. All it takes is a few seconds in the microwave to thaw and warm, and the meal is ready! love the zucchini muffin with pureed pear idea! and it’s a good reminder to make some stuff for the freezer, too. Thanks! 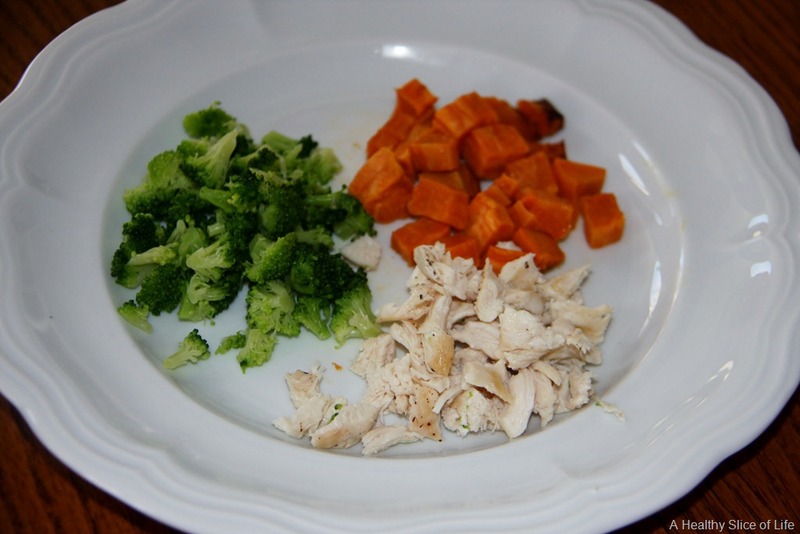 Those are great meals for your little one. L: 1 wholewheat english muffin topped with slice of cheese and tuna. 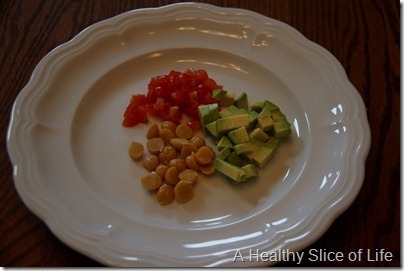 D: Lam with salad consisting of baby spinach, baby tomatoes, Avocado, carrot slices and whole wheat pasta. Mixed with plain yogurt instead of mayo. You really feed your little one such healthy meals. I love your philosophy on food! 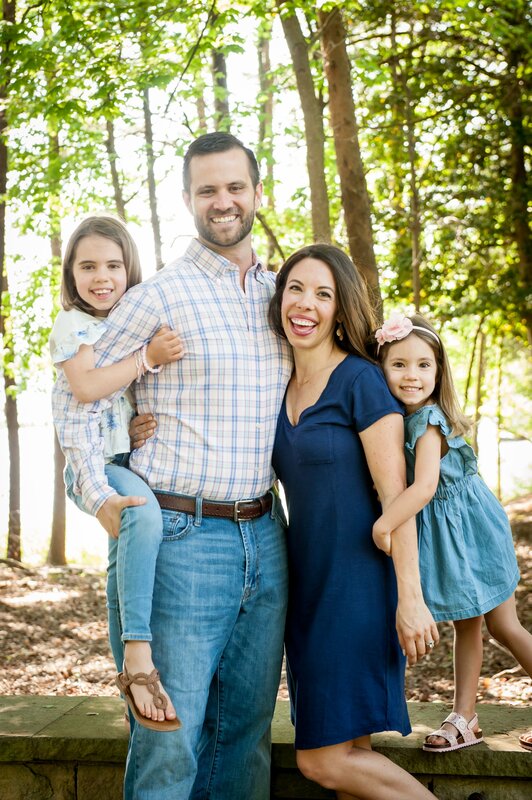 You have a great blog and I will definitely be visiting soon!! First, what is Hailey’s secret for such long hair at such a young age?? 😉 She looks so happy! Second, hooray for more people linking this week! If you only knew how much crazy hair I have, you’d understand why her’s is growing like crazy, too- haha! And yes, I’m so excited to see more people link up. THanks so much for participating with Lula! Hailey is always so good at eating her fruits and vegetables! I wish Liam would get better at that! That breakfast looks delicious, I might have to make that tomorrow!